What a mess! Pledge one thing, do another... Can someone tell me what the point of Lib Dems? Ah yes, I remember they are the progressive anti-Tory party that has vowed not to make Thatcherite cuts in the first year, vowed not to increase tuition fees, and wanted proportional representation. 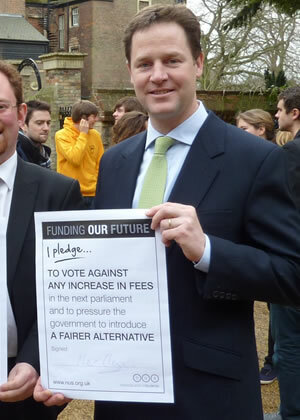 Great piccy of Clegg pledging not to increase tuition fees from Left Foot Forward. From the Guardian: "The business secretary's admission, in an email to party members on the eve of the publication of the most significant review of university funding in decades, confirms that he has accepted the case for higher tuition fees. Cable – like all Lib Dem MPs – signed a pledge at the recent Lib Dem conference to oppose any increase in fees."